Stem cells are a valuable resource for medical and biological research, but are difficult to study due to ethical and societal barriers. However, genetically manipulated cells from adults may provide a path to study stem cells that avoid any ethical concerns. A new video-protocol in JoVE (Journal of Visualized Experiments), details steps to generate human induced pluripotent stem cells (iPSC) from cells in the peripheral blood. The technique has been developed by Boston University's Dr. Gustavo Mostoslavsky and his colleagues. Stem cells are unique because they can self-renew, differentiate into multiple cell types (pluripotency), and are immortal. Fertilized eggs produce embryonic stem cells with the potential to differentiate into any other cell type. Despite their value, embryonic stem cells pose a variety of ethical, legal and political implications that cause scientists to look for less controversial paths of study. "As opposed to human embryonic stem cells that originate in fertilized eggs, human induced pluripotent stem cells can be generated from any cell, and there are no ethical barriers to this," Dr. Mostoslavsky explains. 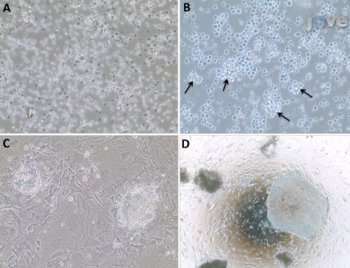 "Our article describes a methodology to obtain high quality, induced pluripotent stem cell lines," Dr. Mostoslavsky continues. His work is particularly interesting to the stem cell research community because "blood is an easily accessible sample for most laboratories. Our procedure uses a vector we created and produced a few years ago, and is very efficient. Our colleagues are very interested in that high efficiency. We published in JoVE because there are some technical details in the protocol that are best conveyed with a video-protocol. " Dr. Mostoslavsky uses induced pluripotent stem cells to model genetic lung diseases, providing a fast track to study rare diseases in the laboratory. This technique will prove a valuable time and cost saving resource for other scientists interested in genetic disorders. The video-protocol was published in JoVE on October 31, 2012. JoVE Senior Science Editor Dr. Nandita Singh tells us, "We are excited to describe the generating of human iPSC using a lentiviral vector the Yamanaka factors. This vector was developed in Dr. Mostoslavsky's lab. The ease of obtaining the tissue sample combined with the high efficiency of reprogramming makes this method a very valuable tool in the field. The JoVE format will help the scientific community to accurately replicate this methodology.